Think the world's biggest jumble sale. Anything and everything you can imagine on sale, out in the open and covered in a fine yellow layer of desert dust. That's Haraj bin Gassem, better known to many of us as the Princess Souk. I visited last week. 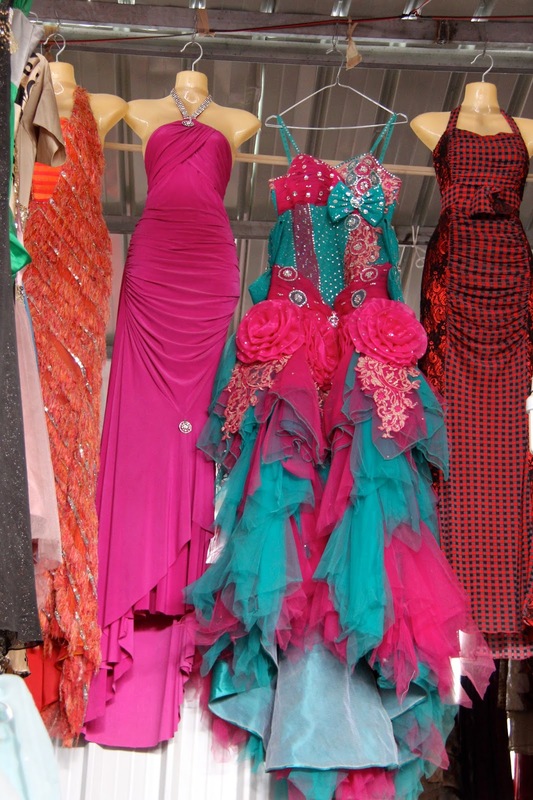 I'd heard so much about the amazing Princess Souk gowns, I wanted to see it for myself. Despite the name though, Princess Souk has little to do with real live princesses. As the story goes, it’s more about the dresses they might have worn once or twice, and then discarded. And as we made our walk past dress racks and over the general detritus that littered the ground, it became increasingly hard to imagine any self-respecting princess wearing some of the gowns on display. I suspect the story, and the gowns, have changed somewhat over time. I’d never seen anything like it. There were gowns in racks, on mannequins, suspended from the ceiling, lying in piles on the ground. Most glittered with sequins, beads, and an over-abundance of decorations. Hardly surprising then, that this souq's also known as Saudi Gaudy. We saw the whole gamut of female formal attire from wedding gowns to dresses for small princesses. Friends had told us that we needed to bargain before buying anything. The general rule of thumb was that nothing should cost any more than 25 Saudi riyals. That’s about NZ$5.00! Little wonder then, that the woman trawling through the rack beside me was looking for a school ball dress for her daughter in England. She found a long, flowing green gown and asked me if I thought a 16-year-old would like it. 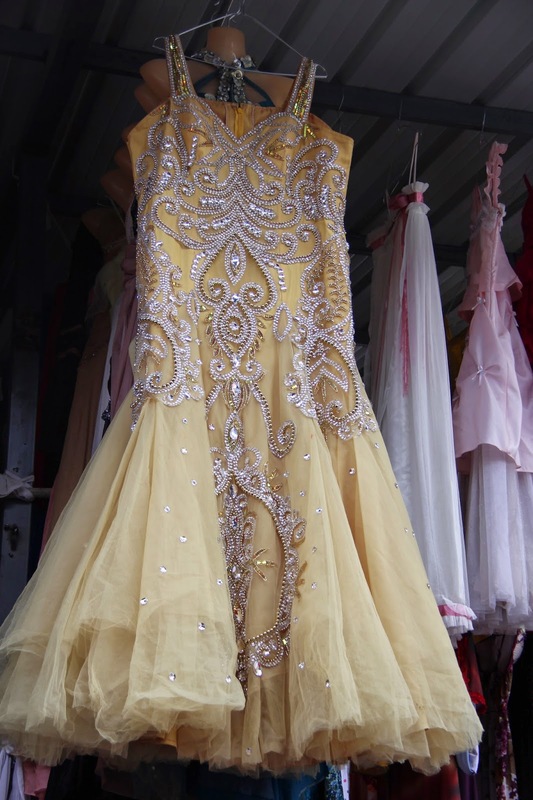 “The dry cleaning’s likely to cost more than the gown itself,” she added, with a smile. And then there were the ones that were just overdone and eye-grabbingly awful. We saw everything from the 'pretty' to the 'pretty awful', the absurd, the eclectic and the OMG-totally-over-the-top-and-theatrical. I was on the look-out for costumes that would do for a children’s drama production. I spotted one that looked workable. I needed something that would do for a child who was a small bird. This was blue and had a skirt made of strips of fabric that I imagined would flow and flit in a bird like fashion. We paid 5 riyals. At this price, I thought, it really didn’t matter whether we used it or not. At midday the call for prayer sounded. Some stalls covered their wares but many didn't bother. I'd heard that the muttawa (religious police) rigorously patrolled this area, but we saw none. I wondered how some of the clothing on display had avoided their attention. Given Saudi's conservative Muslim culture, there were things on display that just looked wrong! My cell phone went and it was a friend. She had visited the souq before and wanted to make sure that I knew to watch my purse carefully. Apparently there were pickpockets everywhere. Ironically, at the exact moment she rang my husband had just discovered that his cell phone had gone missing: fortunately for him it turned up later. He’d left it in the car. I’d heard many stories of the men who worked here and their perverted behavior. We were prepared for the worst and moved around pretty quickly from stall to stall. Thankfully we saw nothing amiss, but I accept that our experience was probably not the norm. And then it was time to leave, away from all this colour and flamboyance back to the Riyadh where women are covered in abaya and headscarf. From tradition to modernity and from conservatism to haute couture; this had been a visit where I'd seen both the contrasts and contradictions in the way women here live. Pomegranates, Sharing Recipes Long Distance, and An Unwelcome Dinner Guest. I'm Penelope, living in a country that's as about as far from home as you could imagine. I've exchanged glaciers for desert and sheep for camels. This is about my journey.